Check out some of the team's most drastic lineup changes! There's only one thing Avengers have come to count on when it comes to Earth's Mightiest Heroes, and that's their ever-changing roster. 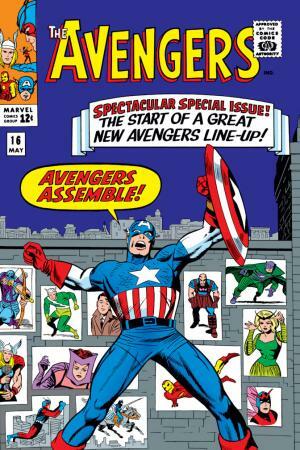 Over the course of their 50-year history, the Avengers have turned lineup changes into a tradition. There will be deliberation, there will be honored newcomers, there will be hurt feelings, Jarvis will provide snacks, and there will usually be a press conference. We figured that right now would be a great time to revisit five comics that tie into the most comforting of all the team's traditions. 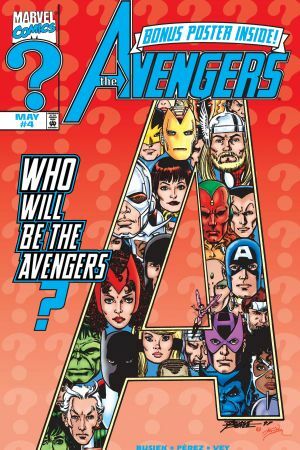 Presented here, in chronological order, are five Avengers lineup shake-ups. On the Matter of Heroes! The team came under government control for their next shake-up. 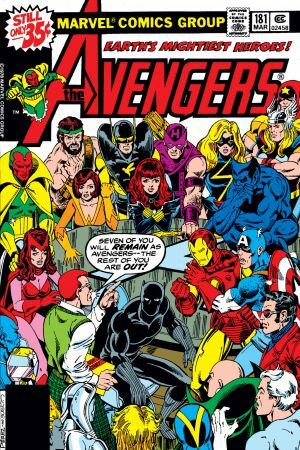 In order for the National Security Council to keep closer tabs on the team, government agent Henry Peter Gyrich pared the team down to a manageable seven members: Iron Man, the Vision, Captain America, Scarlet Witch, Beast (who joined during a previous shake-up), the Wasp, and the Falcon. The hotheaded Hawkeye didn't take to kindly to getting the boot. Following two more roster shake-ups in issues #221, which added Hawkeye back to the team and made She-Hulk an Avenger, and another one in #305 that brought Black Panther back into the fold, Captain America held another press conference to announce a new roster. After deliberating for hours and consuming massive amounts of takeout food, the dozens of Avengers assembled in their mansion's subbasement reached a decision that fit within the guidelines set by the United Nations. Captain America, Thor, Sersi, Vision, Quasar, Black Wido, and She-Hulk would form the primary unit, and the teenage hero Rage and the ex-criminal called Sandman joined as probationary reserve Avengers. 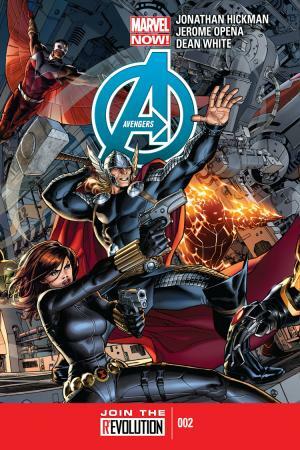 After returning to active duty following a lengthy detour through another dimension, the Avengers faced quite possibly their highest profile retooling yet. 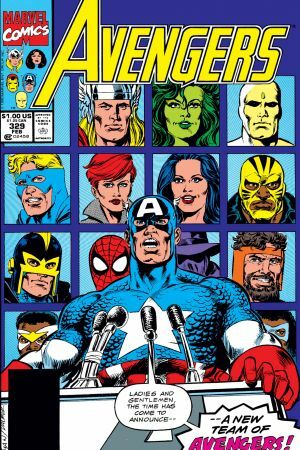 A small army of reporters and cameramen camped out in front of Avengers mansion, interviewing every hero on their way out until the team finally made an announcement. Captain America revealed the new roster, which included himself, Iron Man, Thor, the Vision, Scarlet Witch, Hawkeye and Carol "Warbird" Danvers, as well as ex-New Warriors Justice and Firestar in the reserve positions. More recently, Captain America and Iron Man decided to expand the team's ranks in order to protect the entire planet from every possible threat. In order to do so, they had to think big. In addition to Steve and Tony, stalwarts like Thor, Hawkeye, Black Widow, Captain Marvel, Falcon, and the Hulk joined the team. 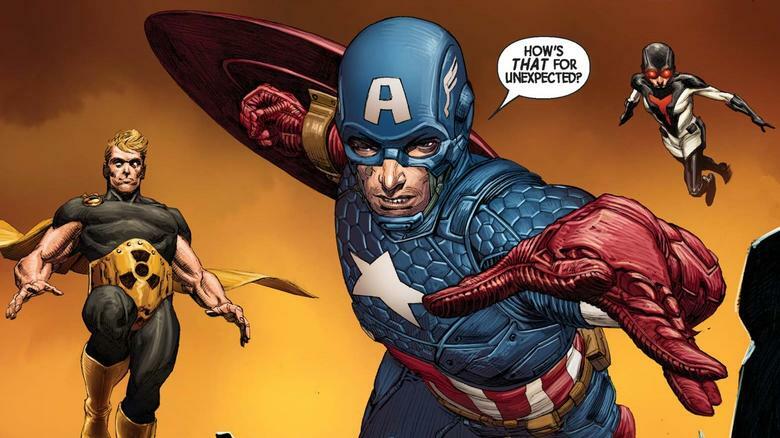 Heroes added during the New Avengers era (Wolverine, Spider-Man and Spider-Woman) came on board. Experienced heroes Hyperion, Shang-Chi, Sunspot and Cannonball finally became card-carrying Avengers, and newbies Smasher and Captain Universe rounded out the expanded roster. Henry Peter Gyrich would have flipped out if he had been in charge of this large team.